In a world where physical retail is finding itself facing a completely different adversary, where lines between physical stores and digital platforms are fading, traditional ways of product display need to change, don’t you think? We do too!! So we created shop fitting solutions that empower you to reshape your retail experience. We’d love to help empower your retail business to take on the challenges of the OMNI channel era. Just click below to schedule a demo at the INSYNC Experience Centre. Electrified Shop Fitting solutions that Empower the Seamless Integration of the excitement of physical retail and the efficiency of digital retail. A solution that fits every space, window, wall, pillar or floor. You deserve to start up your store, quickly and effortlessly!! As Shop Fitters it’s our job to help you do so. A good looking store does not have to cost a fortune. We create shop fitting solutions that give you the efficiency of our standardised parts with the satisfaction of creating something bespoke to your needs. We call that STANDARDIZED ENGINEERING CUSTOMIZABLE SKINS at INSYNC. Opening stores should be quick and easy, shouldn’t it? To facilitate that, we created a comprehensive range of shop fitting systems for you to choose from. Providing you complete peace of mind after they’re installed since we’ve paid special attention to safety. Whether you’re looking for a future-focused solution for creating an omni-channel SMART SHOP or want your space to simply look awesome on a budget, you’ll find something for you at INSYNC. Our catalogue holds 3000+ shop fitting components covering a wide range of retail sectors and budgets. Yet, what we really do, cannot be catalogued!! There’s no substitute for old fashion empathy, sitting down with you and understanding your dreams and challenges and providing you with an optimised solution to perfectly display merchandise you’ve painstakingly curated. Customising our solutions to fit your sizes and colour requirements, creating skins around our parts using a gambit of surface treatments, materials, and finishes, so that your space looks truly built for you!! The challenging opportunity given by Mr Tata of opening 28 stores in 28 days itself was very intimidating. This achievement would not have been possible without the unstinted support of Insync Shop Fitting’s design and installation team. Their timely delivery of fixtures and ready team of installers ensured that all stores were handed-over on time. Inspite of the huge volumes of fixtures to be manufactured for 28 stores in a short span of time, there were absolutely no compromise on the quality of the materials delivered. Excellent work !! Looking forward to continue the successful relationship in the coming financial year as well. Restore Solutions have been working with Insync / Safe Enterprises for more than two years on several different projects. In that time we have developed an extremely amicable and professional working relationship. Restore have had superb delivery of service in all aspects of design, technical input and delivery from the Safe Group. 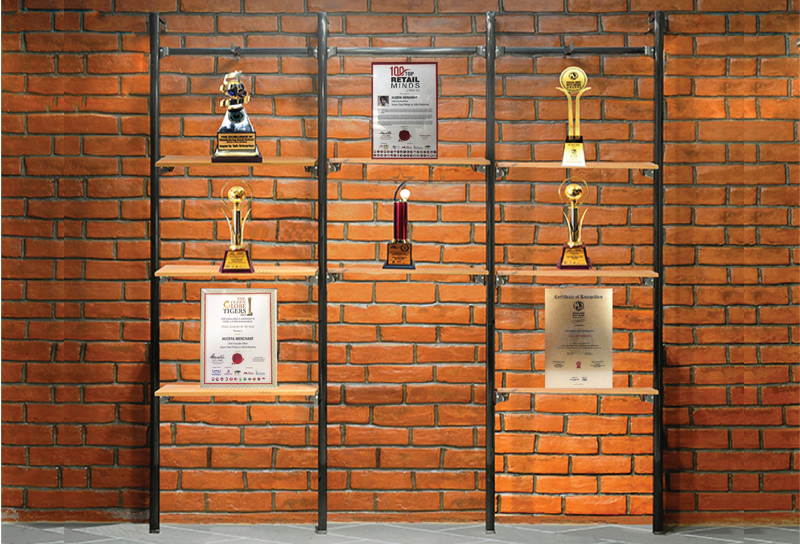 Insync / Safe, are one of the few dependable manufacturers of retail hardware for retail design in India. Their product offering is engineered for ease of use and fits easily into our designed spaces. There are multiple solutions available and the fixtures have superb quality, functionality and adaptability. Insync / Safe worked very closely with Restore on our extremely successful roll-out of the modular design project for Louis Philippe - EBO’s. We would not have been able to deliver the modular effect required had it not been for all the re-engineering and R&D by Insync / Safe. Another store design project that Restore & Insync worked closely on was the design and fit out of the Sports Connect brand. Again, Insync / Safe provided excellent value addition by helping to create bespoke fixtures which are not readily available in catalogues. I would like to add one final comment, that is, I have always felt confident working with, Huzefa Merchant, CEO, Insync Safe Enterprises because not only does he take business very seriously but is readily available all the time, to field calls and find solutions to problems. It is a pleasure to work with Huzefa and his team and Restore will undoubtedly be working with the Safe Group far into the future. Mr. Stuart Simon | CEO & Head of Business, Restore Solutions. “Our association with Safe Enterprises, began when we redesigned the store identity of Natures Basket along with FITCH and M/s Safe Enterprises was selected from amongst other manufacturers as the vendor of choice to partner with us in the design and creation of aesthetic, flexible and robust fixtures for our world food stores. Over the last year and a half of association with them, I must admit that today I feel both relieved a having made the right decision then as well as happy that we have found a partner in true sense of the word. The team understands our vision and is willing to go the extra mile to deliver. They’ve taken ownership of the initial hiccups and assisted in working around where required. As a retailer, our demands can sometimes be chaotic but have never found them shying away in meeting our deadlines or reengineering last moment design changes where required. In Huzefa Merchant, the man behind Safe Enterprises, we seem to have found not just a bright spark who understands his business and ably leads his team but a friend who also thinks on behalf of his customers. My best wishes are with the entire team at Safe Enterprises to reach greater heights and grow their business manifold. My association with Saleem bhai has been almost 15 years and I have seen every year his quality his workmanship and his zeal to service his customers the standards going higher. I think what I see right now is a big improvement of what I saw last year at Euro shop and I am sure this will keep improving as we move ahead. I wish him and his entire team all the best and I am sure we’ll have great things to achieve together. Why visit us at In-store Asia?